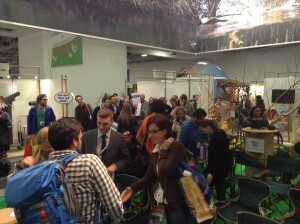 The “buzz” and energy around ITB-Berlin was simply different this year. 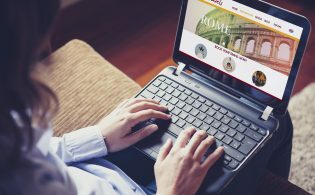 The tourism industry, fresh off the highest volumes of travelers ever recorded worldwide and bolstered by research that the industry accounts for 1 out of every 6 jobs on the planet, finally appears to have come to terms with the reality that to operate in this sector, more responsible tourism practices are the new norm. Eight ATTA team members just returned ITB Berlin with their schedules brimming with speaking engagements, meetings and special ATTA-sponsored events. The Adventure & Responsible Tourism Hall, where the ATTA’s stand was situated and where dozens of ATTA members were on exhibit, was its busiest since its inception ten years ago. 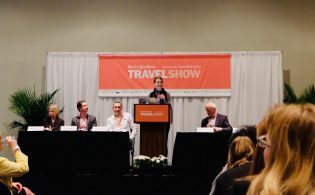 The ATTA noticed an obvious influx of new interest in adventure travel throughout the event with many unsolicited visitors dropping in to get engaged, whether tourism associations, tourism boards, business leaders or students. In discussions surrounding the economic sustainability of travel, adventure travel was top of mind as an approach to travel that benefits local communities, wildlife, cultural heritage and local businesses and government. Further, while at ITB, the ATTA received an early glimpse at its most recent Adventure Tourism Market Study with The George Washington University, and found that growth in the adventure tourism sector has risen notably – research which is set to be released in the coming months. The preview to the study promises positive news for adventure tourism, and further cements the position that adventure tourism as “the sector to watch” in the broader leisure tourism industry. An oft quoted figure recently is that global travel has passed the one billion human mark; a more transparent way of understanding the modern scale of tourism is that one in seven people in the world are traveling internationally. According to Dr. Roland Conrady at ITB Future Day, the megatrends to watch within this landscape are global digitalization, the dynamic socioeconomic shifts taking place in India, Asia, Latin America, and a consumer focus moving towards Health & Wellness as well as sustainability. One coup the industry has achieved is transforming the idea of a holiday as a basic need, so it is something that is prioritized even during less wealthy time periods. Even as consumers look to traveling further afield, they are booking shorter stays, and often stepping down in quality or looking for all inclusive deals. This general tourism trend is in direct contrast with data on global adventure tourism, which indicates travelers in this niche stay longer, spend more and seek value in more experiential terms. Another shift here to stay is the shorter booking window as people are less inclined to make a commitment too far ahead. This means the industry needs to excel at managing yield, supply/demand and price flexibility. While the consumer focus remains on value, realize that offering increased flexibility and choices may become an equally important part of the “value” concept as price. President Shannon Stowell addresses an audience on adventure tourism trends. President Shannon Stowell and Executive Director of Europe Chris Doyle presented, “Imagine. Inspire. Invest.”, conveying adventure travel trends to approximately 50 show-goers, as well as defining a responsible path for the long-term health and viability of the industry. Stowell was also both emcee and moderator in the Main Congress for the Corporate Social Responsibility Day (CSR), which took place March 7th, and on March 9th followed up by speaking to an audience of diplomats and Masters students at the Institute for Cultural Diplomacy. Concurrent with the CSR Day moderated by Stowell, Doyle joined the, “Shifts of Travel Culture” panel, attended by more than one hundred – nearly half of which were represented by the next generation of tourism industry executives. Responding to the composition of the audience, Doyle shifted gears in discussing tourism trends to better relate to those who might one day define how tourism will be developed and executed, with more astute execution of responsible tourism values. South America – Focus on safety issues, certifications and sustainability. Discussions on how to make the most of ‘word-of-mouth’ business generation, and when / how to differentiate between adventure tours. Product Innovation – What separates you from the competition in the field, via marketing, via technology? 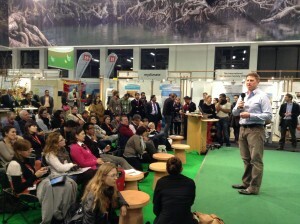 The Peer-to-Peer Exchange was followed by a hosted AdventureConnect social hour sponsored by Turismo Chile, where more than 100 joined in for further networking. On Friday, 8 March, The Blue Yonder presented the Responsible Tourism Networking period, which was co-sponsored by the ATTA and other organizations, where case studies drawn from around the globe illustrated the fully-packed venue the potential for small deeds and projects to have profound impacts on tourism development. 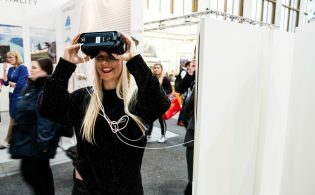 In addition to a solidly attended networking period with beverages, an “open microphone” period ensued, with more than a dozen audience participants showcasing innovative new projects that are sure to spur new and inventive ideas among those present.